Re: Refrigerator or chest freezer? My Johnson digital controller has a short cycle prevention setting. Also, a big freezer can hold several carboys. I like my fermentation "closet" cooled by an a/c unit. Build it to size/fit what you want/need. I had the a/c unit, so it was wood and insulation and screws 30$ or so for mine. Would like to see pictures of your setup. Maybe post one or link to one that is up? Chest freezer problems are numerous. They creat a Tom of condensation, they only last about 4-5 years cycling the compressor on and off, and they are a pain in the back lowering kegs, carboys, buckets. But on the other hand, I can fit 8 kegs in my chest freezer, so that's what I go with! Even though it's around 100F in my garage right now, I'm fermenting a smoked roggenbier at 54F internal temp(notice the temp probe wire going into the thermowell). The AC probably runs less than 15 minutes per hour to keep the temp stable. I want something I can get 2 buckets into. They'll go in empty, so that solves at least the first part of the problem. Still gotta get the full ones out, though! If I could fit in a couple kegs for storage, not serving, it would be a plus. 15 cu ft chest freezer is what I use. Works great. Holds 4 buckets easily. You could maybe put the freezer up on a frame (in the south we just use cinder blocks ) off the ground and siphon the beer out. Thanks for the info. Off to price freezers! 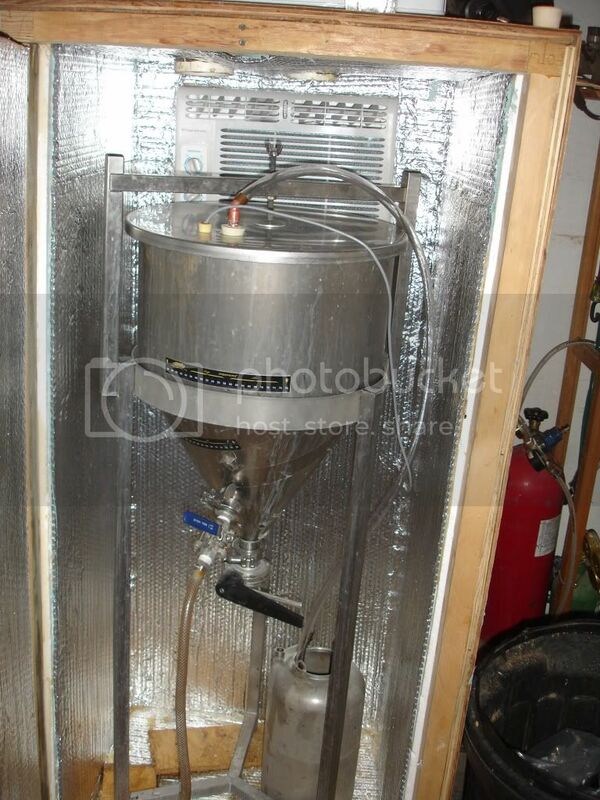 If you're not in a huge rush and want to price shop http://www.homebrewfinds.com usually finds a good deal on various models a couple times a month. The sale prices are usually a real good deal if you find a model on sale that fits your needs. Thanks. There's no big hurry, so I'll check it out. I found one at Home depot for about $400, including delivery. Delivery is important. I have no way to haul one. Never pay full price. Sale prices an freezers are sometimes 40% below "retail." Yeah, that's what I'm finding as I look. I've got the Ranco dual stage. Very happy with it. Whichever I use for fermentation, I don't imagine it being opened too frequently. If I go for the freezer, I'll put empty buckets in it and pump the wort in. Chest freezers sweat (a lot) at fermentation temps. Even though I clean mine fairly regularly, I wouldn't trust it with open fermentors and sweet wort. Plus you'll have to eventually get the wort OUT, so unless you're somehow elevating the freezer, you'll have to lug full buckets up and over anyway. I got my little ferm fridge free on the side of the road when a couple moved out down the street. It works great. Barely fits one bucket, but that's all ya need. As far as the controller: My ambient basement temperature (where the fridge is) is usually lower than my ale ferment or diacetyl rest temps, so I use a dual stage and a heat belt to keep the fermenter temp steady at the back end of fermentation.